Vuthy does not have father. He lives with his mother in a four member family. His elder sister is a breadwinner of the family. Having seen the difficulties, we decided to enroll him into our sponsorship program. His health is fine. He started school later than the school age because he changed school. He never brushes his teeth because he has not get any toothpaste. 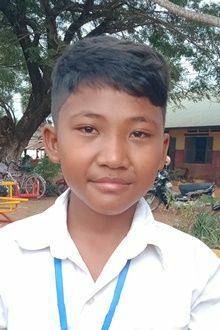 Vuthy lives in Chherteal village. He belongs to a poor family. He lives in a small house, covered with corrugated iron. He does not have enough food nutrition. Tell your friends Vuthy needs a sponsor!